James eagerly accepted his assignment and set out for the British camps, who embraced him without hesitation. He quickly gained the confidence of American turncoat Benedict Arnold, who now had a command with the British Army. (see A Tale Of Two Patriots) While it wasn’t common, it was not illegal at the time to teach slaves to read and write, except in South Carolina due to the Stono Rebellion. (see The Cost Of Rebellion) More laws spread through the states after other rebellions such as the Turner Rebellion in 1831. (see Birth Of A Nation 2016) Therefore, the British would not assume, and likely not suspect, the runaway of having such skills as they spoke openly in front of James while letting him view important documents and maps. As a native of the area, Arnold used James as a guide through Virginia, relying on his intimate knowledge of the terrain. Arnold was so impressed with and trusting of James, that he was not concerned about James overhearing conversations about strategies and battle plans, speaking openly to other officers in front of the spy. James gathered information about locations, munitions and other such data, which he wrote in reports to Lafayette and delivered himself or through other spies. Lafayette used the information to close in on Arnold, yet Arnold evaded capture by fleeing the area. Following Arnold’s relocation to the north, James worked his way into General Charles Cornwallis’ camp, where he became the General’s servant. Also finding James trustworthy and honest, Cornwallis began using him to deliver information to British located across enemy lines. Furthermore, Cornwallis asked James if he would be willing to spy on the Americans, to which James promptly agreed. Therefore, not only was James able to freely move between British camps, he could also cross in and out of American camps easily as well. As James delivered tactical information to British units, he stopped first to see Lafayette and let him review the documents. While there, James collected false intel about nonexistent units, munition levels, supplies, and locations which he delivered to Cornwallis. As James was a spy and not a soldier, the Act did not apply to him, so he remained with Armistead. In 1784, likely during his visit to the states, pro-abolitionist Lafayette discovered that James was still enslaved. (see Hero Of Two Worlds: The French Years) Therefore, Lafayette penned a respectful testimonial, praising James’ actions during the war deserving his freedom. Along with this recommendation and his owner’s blessing, who was now a member of the House Of Delegates, James petitioned the Virginia Assembly in 1786 for his freedom. The Assembly emancipated James on January 9, 1787. Out of gratitude and respect for his former commander and dear friend, James changed his name to James Armistead Lafayette. A free man, James married and raised a large family on 40 acres he bought nine miles south of New Kent, near Richmond, Virginia. In 1818, he applied for financial aid and was granted a one-time payment of $60. The Virginia legislature also rewarded James with a $40 annual pension for his services during the American Revolution. Over time, James became a very successful farmer. The Marquis de Lafayette visited America again at the invitation of President James Monroe and Congress in 1824. (see Hero Of Two Worlds: The French Years) During one of the many processions organized to honor the General, Lafayette surveyed the crowd. To his pleasure and surprise, he recognized the face of his beloved friend among the spectators. Immediately stopping the procession, Lafayette quickly rushed to James where they shared a heartfelt embrace. 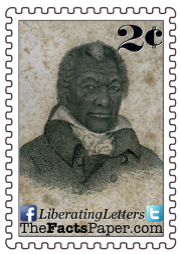 James Armistead Lafayette died on August 9, 1830, a War hero and a free man. Liberty, history books have all but erased James from their pages. Stories of Negros, especially slaves, supporting the American Revolution and the United States destroys the narrative of complete oppression. (see The Forgotten Black Founding Father and Hoosier Daddy) Likewise, examples of emancipation and abolition are also suppressed and ignored so as to further the argument that all white Americans were racist. (see The Color-Blindness Of Slavery and Inalienable Rights). It is sad that heroes and Patriots such as James Armistead Lafayette are ignored and hidden just to further an agenda. Therefore, Liberty, today’s Patriots must work even harder to find those stories and spread them far and wide. It is time to stop dividing ourselves and find ways to unite, such as celebrating Patriots like James, regardless of race, creed, color, or religion. After meeting James, Lafayette realized how important the literate slave could be to the Patriot’s fight. The British made it known that any slave who fought for their cause would win their freedom. Ironically, it was the crown who enslaved them in the first place and it, including King George III, rejected every effort the colonists made for abolition. (see The Forgotten Midnight Ride) Now the British were willing to grant freedom to a few Negros in efforts to continue to enslave all the colonists. Therefore, Lafayette designed a story that James was a runaway slave wanting to fight for the Red Coats while his real mission would be to spy on their movements, supplies and plans. James scurried through the trees on trails he knew blindfolded. He spotted the camp and darted around to the commander’s tent. James could hear voices inside and strained to understand the words. One voice was unmistakable as his French accent highlighted his perfected English. James glided around to the entrance unnoticed before slipping inside. It was the moment that changed the war. Born in Virginia, James was the slave of William Armistead. As such records for slaves were not well kept, if even recorded at all, his actual birthdate is unknown. It is believed to be around December 10, 1748, in New Kent, Virginia, or December 10, 1760, Elizabeth City. Regardless, after the Marquis de Lafayette retuned to the states and the Revolutionary War in 1780, James requested permission from William to join the Continental Army under Lafayette, which William granted. 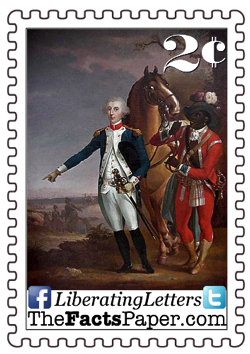 James had heard the stories of heroism of Lafayette, who was now stationed in Virginia, and wanted to serve under him. (see Hero Of Two Worlds: The American Years) As was common, James enlisted as James Armistead, taking his owner’s last name.